Almost halfway through the April KGS Insei League, Ali Jabarin (OohAah) has taken the lead with a perfect score of 8 wins, including one against KILL founder Aleksander Dinerchtein 3P (Breakfast), his main teacher there. Jabarin lives in Israel and is a former Youth Champion of Europe. Argentinan danigabi is undefeated with 5-0, while Fredda (Fredrik Blomback 5d) from Sweden has won one. Artem92 (Artem Kachanovskij 6d, Ukraine), who won the first league, is at 2-1. DRhazar (Canada) 8-0, fantastigo (Germany) 3-0 and Maroncsan (Hungary) 1-0 lead in the B-league, with Kalmah (Finland) at their heels with 90%. 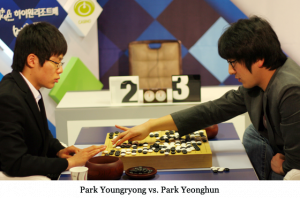 Park Yeonghun 9P (r) defeated amateur Park Youngryong 7d by resignation in the 38th Myeongin (Meijin) Preliminary Tournament Finals on April 17. 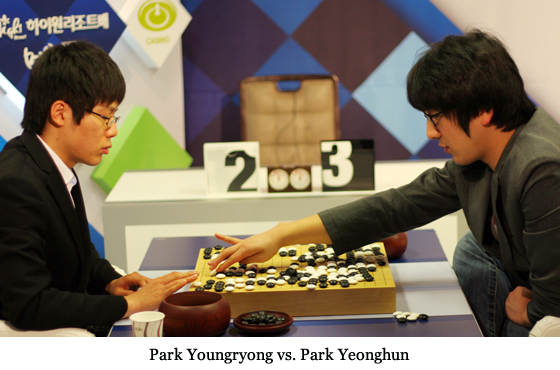 The Myeongin consists of 12 players divided into two leagues who compete in several stages. Last year’s Myeongin was Lee Changho 9P, who has won the title 13 times. Local hero Marek Kaminski 3d (r) swept the top section of the Poznan Open 5-0 in Poznan, Poland the weekend of April 10-11, ahead of Mateusz Chojnicki 1d of Bydgoszcz and Artur Chmielewski 4k of Starogard. “My toughest game was with Artur,” Marek told the E-Journal. ” I think he is not 4-kyu, but at least 1-dan!” He added that the tournament atmosphere “was very nice… until we heard the news of the tragic crash, in which we lost so many prominent Poles.” Locals dominated the second section as well: Dariusz Bednarczyk (5-0), Mikolaj Olszanki (both 6k) and Marek Maksimczyk 4k of Lódz (both 3-2). Wojciech Slusarczyk 9k, Marcin Samson 14k (Srodkowa) and Tomasz Nawracala 11k all won four games in group 3 with nine players. 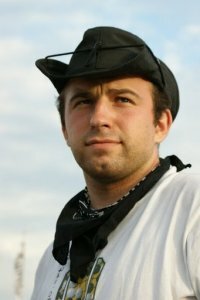 Winner Kaminski, whose nickname is Kamyk, added his first video for the channel WOG-Honte with “Go Crazy” as theme song, compiled from his gallery. Notice how his large white moyo turned into a won endgame. WOG is Wielkopolski Osrodek Go, the Greater Polish Centre of Go. Wielkopolski is a large province in Poland; Poznan is its capital. 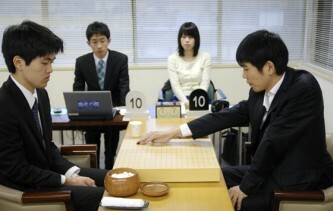 In the Fujitsu Cup quarterfinal matches Wednesday, April 14, China flexed its muscles and won three of the four matches. Lee Sedol 9P was the only Korean to make the Final 4, defeating Gu Li 9P by resignation and joining China’s Kong Jie 9P, Qiu Jun 8P and Piao Wenyao 5P for the semifinals. With the July 3 semis nearly three months away, it’s difficult to identify any clear favorites, as there’s a lot that can happen in the next few months. Lee’s been on a very solid winning streak, Piao Wenyao has stacked up some impressive wins as of late, and Kong Jie is China’s top player. Whatever the outcomes, it will be an exciting series of matches. With 14 tournaments and 62 games, Bay Area Go Players Association organizer Roger Schrag leads the American Go Association’s new running Top-10 lists for rated games and tournaments. Kelsey Dyer is 12 games back, at 50 rated games over the last 12 months, while Gordon Castanza is second in events with 11. The Top 10 will be updated daily; for more tournament data and crosstables, visit the American Go Association Go Database. With all six of Japan’s players eliminated in the second round of play on Monday, April 12 in the Fujitsu Cup, Korea and China will battle it out for the championship. In the April 14 quarterfinals, it’s Gu Li 9P (CN) vs Lee Sedol 9P (KR), Park Yeonghun 9P (KR) vs Piao Wenyao 5P (CN), Kim Jiseok 7P (KR) vs Kong Jie 9P (CN) and Qiu Jun 8P (CN) vs Kang Dongyun 9P (KR). 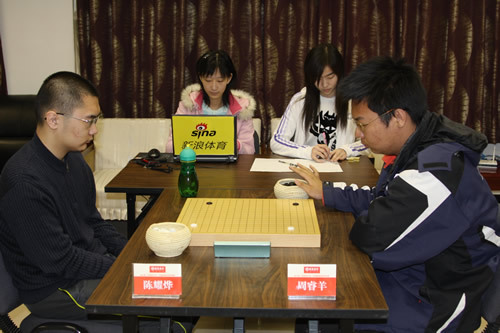 Chen Yaoye 7P (l) defeated Zhou Ruiyang 5P (r) by resignation on Tuesday, April 13 in the semifinal match of the 2010 CCTV Cup. Chen will play the winner of the semifinal match between Gu Lingyi 5P and Piao Wenyao 5P. Two-time US Open champ Myung Wan Kim 8P leads a field of over 40 highly-ranked players already registered for the first Strong Players’ Online Tournament I. Registration is open through this Thursday, April 15; players must be AGA members, members of the Canadian or Mexican Associations, at least 5.0 AGA rating or equivalent – professionals are welcome — and have a webcamera, Skype and KGS accounts. Undefeated in all AGA tournaments since he moved to L.A. in 2008, Kim currently holds the highest rating in North America, making him the odds-on favorite in the online tourney scheduled to start April 24, although there are seven players registered so far with ratings above 8.0 . Click here for the roster. Registration is free. Jan Simara 5d (BUM 6d on kgs) swept the Qualifiers in Plzen — the hometown of pilsner beer — one of the events to gain points to enter the Czech Champs Finals later this year. Multiple former Champion Vladimir Danek 5d only lost to Simara. Ivan Kostka 3d won bronze on sos. Last weekend, 59 came to enjoy the beer.